I repeated the tests described here using a database larger than RAM. The test database has 8 collections/tables with 400M documents/rows per table. I previously reported results for this workload using a server with 24 CPU cores and a slightly different flash storage device. This time I provide a graph and use a server with more CPU cores. The goal for this test is to determine whether the DBMS can use the capacity of a high-performance storage device, the impact from different filesystem readahead settings for MongoDB and TokuMX and the impact from different read page sizes for TokuMX and InnoDB. It will take two blog posts to share everything. I think I will have much better QPS for MongoDB and TokuMX in my next post so I won't list any conclusions here. I used my forked Java and C sysbench clients. The test query fetches one document/row by PK. The test database has 8 collections/tables with 400M rows per collection/table. All are in one database. I still need to enhance the Java sysbench client to support a database per collection. I tested the configurations listed below. I don't think these are the best configurations for TokuMX and MongoDB and am running more tests to confirm. The test server has 144G RAM, 40 CPU cores and a fast flash storage device. orig57.handler - 740G database, official MySQL 5.7.4, InnoDB, page_size=8k, data fetched via HANDLER. Results for MySQL 5.7.4 are not in the graph to keep it readable and are similar to MySQL 5.6.12. Note that MySQL is able to get more than 100,000 QPS at high concurrency, TokuMX reaches 30,000 and MongoDB isn't able to reach 20,000. I think MongoDB and TokuMX can do a lot better when I reduce the filesystem readahead for both and reduce the read page size for TokuMX and results for that are in my next post. MongoDB also suffers in this test because the PK index is so large that all leaf nodes cannot fit in RAM so there is more than one disk read per query. This isn't something that goes away via tuning. The workaround it to make sure the database:RAM ratio isn't too big (and spend more money on hardware). This lists the QPS from the graph. These tables list the average disk read rate from iostat r/s and the average number of disk reads per query. InnoDB is by far the most efficient with the smallest number of disk reads per query. TokuMX benefits from having the smallest database courtesy of quicklz compression but might suffer from a larger read page size (32k and 64k). But I don't think that is the only reason why the disk reads per query ratio is so much larger than InnoDB and TokuMX. I am repeating tests with an 8k read page size to confirm. MongoDB suffers from a PK index that is too large to be cached so disk reads are done for it and the document store. Both TokuMX and MongoDB might also do extra reads because of the filesystem readahead and I am repeating tests with smaller values for it to confirm. MongoDB and TokuMX saturated at a lower QPS rate then MySQL when running read-only workloads on a cached database with high concurrency. Many of the stalls were on the per-database RW-lock and I was curious about the benefit from removing that lock. I hacked MongoDB to not use the RW-lock per query (not safe for production) and repeated the test. I got less than 5% more QPS at 32 concurrent clients. I expected more, looked at performance with PMP and quickly realized there were several other sources of mutex contention that are largely hidden by contention on the per-database RW-lock. So this problem won't be easy to fix but I think it can be fixed. The easy way to implement a reader-writer lock uses the pattern listed below. That includes pthread_rwlock_t in glibc the last time I checked and the per-database RW-lock used by MongoDB. InnoDB used this pattern many years ago and then we rewrote it to make InnoDB better on multi-core. An implementation like this tends to have problems on multi-core servers. The first problem is from locking/unlocking the internal mutex at least twice per use, once to get it in read or write mode and then again to unlock it. When there is contention it can be locked/unlocked many more times than twice per use from threads that wait, wake-up and then wait again. If the operation protected by this RW-lock is very fast then a mutex is usually a better choice. Note that even when all threads are trying to lock in read mode there is still contention on the internal mutex ("mtx" below). Another problem occurs when the thread trying to unlock a RW-lock is blocked trying to lock the internal state mutex ("mtx" below). There might be other threads waiting to run as soon as the unlock gets through but the unlock is stalled because incoming lock requests are competing for the same mutex ("mtx"). I have seen many PMP thread stacks where the unlocking thread is stuck on the lock_mutex call. The alternative that scales better is to use a lock-free approach to get and set internal state in the RW-lock. We did this as part of the Google MySQL patch many years ago and that code was contributed upstream. Such an approach removes much of the contention added by an inefficient RW-lock. It won't prevent contention added because threads want the lock in read and write mode at the same time. That still requires some threads to wait. When we did the work at Google on the InnoDB RW-lock, Yasufumi Kinoshita was working on a similar change. I am very happy he continues to make InnoDB better. A lock-free implementation for a DBMS is likely to be much more complex than what you might read about on the web or a top-tier systems conference paper. There is more complexity because of the need to support performance monitoring, manageability, special semantics and the occasional wrong design decision. For performance monitoring we need to know how frequently a lock is used and how long threads wait on it. For manageability we need to know what threads wait on a lock and which thread holds it. A frequent pattern is for today's special semantics to become tomorrow's design decisions that we regret. But we can't expect perfection given the need to move fast and the rate at which hardware changes. The low-level reader-writer lock in MongoDB, QLock, is a RW-lock with special semantics. It has two modes each for read and write locks: r, R, w and W. It also supports upgrades and downgrades: W to R, R to W, w to X and X to w (I didn't mention X above). Internally there are 6 condition variables, one each for r, R, w and W and then two others, U and X, to support upgrades and downgrades. Read the source for more details. I don't understand the code enough to guess whether lock-free state changes can be supported as they were for the InnoDB RW-lock. /** "read lock, and set my context, all in one operation"
* This handles (if not recursively locked) opening an unopened database. The dbHolder().get() call above locks a mutex in DatabaseHolder while using the database name to find the database object. There is simple string searching while the mutex is locked. It might be easy to move some of that work outside the scope of the mutex and perhaps use a mutex per hash table bucket. Lets get back to the DBRead constructor that was called in the ReadContext constructor above. It calls lockDB to do the real work. The code below will call other functions that lock mutexes but no mutex is held by the caller to the code below. In my case the block with "if (DB_LEVEL_LOCKING_ENABLED)" is entered and lockTop gets called to do the real work. Well, lockTop doesn't do the real work during my benchmark. It calls qlk.lock_r to do that. Almost there, just one more level of indirection. The call to qlk.lock_r calls the lock_r method on an instance of QLock and then something gets done. Eventually the unlock_r method is called for the same instance of QLock. I won't show the route there however. And notifyWeUnlocked provides the special semantics. This includes not letting a new reader in when there is a pending write request. The code below also wakes all waiting write requests when one is waiting. This might cause many threads to be scheduled to run even though at most one will get the RW-lock. InnoDB does something similar. MongoDB 2.6 has a performance regression from using more CPU per query. The regression might be limited to simple queries that do single row lookups on the _id index. I spent a bit of time rediscovering how to get hierarchical CPU profile data from gperftools to explain this. JIRAs 13663 and 13685 are open for this. MySQL gets more QPS using the HANDLER interface than SELECT. I expect the InnoDB memcached API to be even faster than HANDLER but did not test it. fb56.handler - MySQL 5.6.12 with the Facebook patch and 8k pages. Uses HANDLER to fetch data. fb56.sql - MySQL 5.6.12 with the Facebook patch and 8k pages. Uses SELECT to fetch data. orig57.handler - MySQL 5.7.4 without the Facebook patch and 8k pages. Uses HANDLER to fetch data. orig57.sql - MySQL 5.7.4 without the Facebook patch and 8k pages. Uses SELECT to fetch data. tokumx - TokuMX 1.4.1 using quicklz and 32kb pages. There should be no decompression during the test as all data used by the test (1M documents) is much smaller than 50% of RAM. At last I included a graph. I have been reluctant to include graphs on previous posts comparing MongoDB, TokuMX and MySQL because I want to avoid benchmarketing and drive-by analysis. These tests have been time consuming to run and document and I don't want to make it too easy to misinterpret the results. Results for MySQL 5.7.4 are not in the graph to make it easier to read. 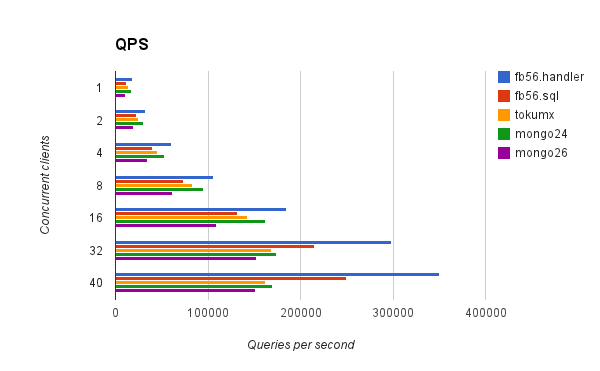 The top two bars (blue & red) are for MySQL and you can see that QPS increases with more concurrency. 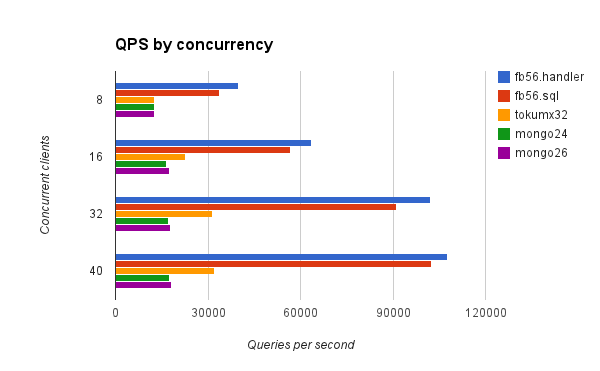 QPS for MongoDB and TokuMX saturates at a lower level of concurrency. Numbers used for the graph above. I used vmstat to measure the average CPU utilization (user + system) during the test. The numbers below are: (CPU_utilization / QPS) * 1,000,000. There are some interesting details. the values are larger for MySQL 5.7 than for 5.6 at low concurrency. Note that in both cases the performance schema was disabled at compile time. the values are much larger for MongoDB 2.6 than for 2.4 and hopefully this can be fixed via JIRAs 13663 and 13685. I also used vmstat to measure the context switch rate and the table below lists the number of context switches per query. Note that the rate decreases with concurrency for MySQL but not for MongoDB and TokuMX. I don't know enough about Linux internals to interpret this. One day it will be easy to get hierarchical CPU profile results for open-source databases using open-source profiling tools. Support for CPU profiling via Google perftools can be compiled into MongoDB via the --use-cpu-profiler option. Given the use of a compiler toolchain in a nonstandard location I also used --extrapath and --extralib to help it find libunwind. However, the profiler output file was mostly empty after doing this and did not have any per-thread results. InnoDB is much faster than MongoDB and TokuMX. This test requires a high rate of dirty page writeback and thanks to a lot of work from the InnoDB team at MySQL with help from Percona and Facebook (and others) the InnoDB engine is now very good at that. Relative to MongoDB, InnoDB also benefits from a clustered PK index. MongoDB is much slower than InnoDB for two reasons. First it doesn't have a clustered PK index so it might do storage reads for both the index search and then while reading the document. The second reason is the per-database RW-lock. As I described previously this lock appears to be held during disk reads when the index is searched so at most one thread searches the index at a time even though there are concurrent update requests. I created JIRA 3177 to make that obvious in the documentation. Because of this the peak rate for MongoDB is approximately the number of reads per second that one thread can do from the flash device. The device can sustain many more reads/second with concurrency but MongoDB doesn't get much benefit from it. I think there will be at most 2 concurrent flash/disk reads at any time -- one while searching the index and the other while prefetching the document into RAM after releasing the per-database RW-lock in Record::touch. TokuMX also benefits from the clustered PK index but it suffers from other problems that I was unable to debug. I think it can do much better once a Toku expert reproduces the problem on their hardware. This test used the sysbench clients as described previously. Tests were run for 8, 16, 32 and 64 concurrent clients. There were 8 collections/tables in one database with 400M documents/rows per collection/table. The test server has fast flash storage that can do more than 5000 reads/second from one thread and more than 50,000 reads/second from many threads. The server also has 24 CPU cores with HT enabled and 144G of RAM. The sysbench clients ran on the same host as mysqld/mongod. Tests were first run for 30 minutes at each concurrency level to warmup the DBMS and then for either 60 or 120 minutes when measurements were taken. I tested the configurations listed below. I ran tests for more configurations but forgot to adjust read_ahead_kb so I won't publish results from those hosts. That probably isn't a typo below. InnoDB sustained about 5 to 10 times more updates/second. MongoDB does many more disk reads per update which is similar to the pure-disk results. I don't have the expertise to explain why TokuMX results weren't better but I shared information with the Tokutek team. Bytes written to storage per update is listed for InnoDB to show the impact on the write rate from using a smaller page. That can be important when flash endurance must be improved. What does it mean to make writes fast? It helps to distinguish between the different types of writes. The slowest is a write that must be implemented as read-modify-write. This might require a disk read and can also create contention from preventing concurrent changes to the row for the duration of the read, modify and write. The row might not be unlocked until the change is made durable on storage (commit, fsync, etc) which lets you estimate the peak rate at which a single row can be changed on a traditional DBMS. And this latency between changes can get even worse when there is sync replication or multiple client-server round trips per transaction. The UPDATE statement in SQL is usually implemented as read-modify-write. Some DBMS engines require locking to be done above the DBMS because they don't support locking across operations where read and write are separate operations (RocksDB is an example). Other DBMS engines compensate for that with a conditional put that performs a write when parts of the row have not changed like checkAndPut in HBase. But if the client does a read prior to the write then the overhead from the read still exists. Some UPDATE statements perform changes that are commutative and it is possible to avoid the read prior to the write. That optimization is rarely implemented but it is possible in RocksDB with the merge operator, TokuDB, and Redis. Increment and decrement are examples of commutative operations. But this also requires upsert behavior to handle the case where the row to be changed doesn't exist. If the read is to be skipped it also means that a result cannot be returned -- that is the count of rows changed or the old/new value of the changed column. A blind-write is the easiest write to make fast. This can be done via a Put call with a key-value store like LevelDB or RocksDB. Some SQL operations can also use a blind-write if we have an option to not return the count of changed rows when the statement is executed and the operation behaves like an upsert. This is rarely implemented but TokuDB might help people appreciate it. So there are at least 3 types of writes and from slowest to fastest they are read-modify-write, commutative-write, blind-write. Hopefully these optimizations will become more common in new database engines. From the write operation there shouldn't be a performance difference between commutative-write and blind-write. But the query latency for a row subject to commutative-write can be much worse than for blind-write because many old updates might have to be read and merged. This has a few more details on the results for update-only sysbench using a disk IO-bound workload. I describe the impact from changing innodb_flush_neighbors. The parameter can be set to write back some dirty pages early when other pages in the same extent must be written back. The goal is to reduce the number of disk seeks consumed by page writeback and this can help on disk based servers. There might be a small impact from changing innodb_flush_neighbors on this workload from both the TPS results and the amount of data written to disk per update. In a previous blog post I explained the impact of this parameter on the insert benchmark for pure-disk servers. The benefit there was much greater than here. I think there are fewer dirty pages per extent in this workload because the database is much larger than RAM so the feature is less likely to be used. The test configuration is described in a previous post. The only difference here is that I repeated the test for innodb_flush_neighbors set to 0, 1 and 2. I used sysbench to measure TPS for a workload that does 1 update by primary key per transaction. The database was much larger than RAM and the server has a SAS disk array that can do at least 2000 IOPs with a lot of concurrency. The update is to a non-indexed column so there is no secondary index maintenance which also means there is no benefit from a fractal tree in TokuMX or the change buffer in InnoDB. I also modified the benchmark client to avoid creating a secondary index. Despite that TokuMX gets almost 2X more TPS than InnoDB and InnoDB gets 3X to 5X more TPS than MongoDB. TokuMX is faster because it doesn't use (or waste) random IOPs on writes so more IO capacity is available for reads. In this workload an update is a read-modify-write operation where the read is likely to require a disk read. MongoDB is slower for two reasons. The first reason is the per-database RW-lock and the result doesn't get better with more concurrent clients. For this test all collections were in one database. The lock is held while the b-tree index for the PK is searched to find the document to update. Disk reads might be done when the lock is held. The second reason is that it does twice the number of disk reads per update while InnoDB & TokuMX do about 1 per update. Part of the difference is that InnoDB and TokukMX have clustered PK indexes but the results are much worse than I expected for MongoDB. I wonder if caching of index leaf blocks is not as effective as I expect or if I am wrong to expect this. Maybe this is one of the problems of depending on the OS VM to cache the right data. The TPS results for MongoDB are limited by disk read latency. Even though there is a disk array that can do a few thousand random reads per second, the array sustains about 150 reads/second when there is a single stream of IO requests. And the per-database RW-lock guarantees that is the case. So MongoDB won't get more than 1 / disk-read-latency updates per second for this test regardless of the number of disks in the array or number of concurrent clients. MongoDB documentation mentions that the per-database RW-lock can be yielded on page faults but the documentation wasn't specific enough for me. I think this is what you need to know and I hope MongoDB experts correct any mistakes. Yield is only done for access to documents. It is not done while accessing primary or secondary indexes. To see in the code where a yield might be done search for calls to Record::_accessing() which throws PageFaultException. The record might also be "prefetched" after releasing the per-database RW-lock via a call to Record::touch(). Yield is done on predicted page faults, not on actual page faults. AFAIK, a signal handler for SIGSEGV could be used to do this for actual page faults and MongoDB creates a handler for SIGSEGV but only to print a stack trace before exiting. MongoDB has something like an LRU to track memory references and predict page faults. I haven't spent much time trying to figure out that code but have seen those functions use a lot of CPU time for some benchmarks. I am curious why the btree code uses that tracking code (it calls likelyInPhysicalMemory). To learn more about the page fault prediction code read the functions Record::likelyInPhysicalMemory and Record::_accessing and the classes PageFaultException and Rolling. From reading the above you should assume that you really want all indexes to be cached in RAM. Alas that can be hard to do for big data databases. For this test my server has 72G of RAM and the PK indexes are 83G. So I know that all of the indexes won't be cached. I tried to overcome disk read stalls during index searching by changing the Java sysbench client to manually prefetch the to-be-updated document by calling findOne prior to the update. That improved TPS by about 20%. I hoped for more but the prefetch attempt needs a read-lock and pending write-lock requests on the per-database RW-lock appear to block new read-lock requests. I think this is done to prevent write-lock requests from getting starved. My attempt is not a workaround. MongoDB does twice the number of disk reads per update compared to TokuMX and InnoDB. MongoDB TPS does not increase with concurrency. TPS does increase with concurrency for InnoDB and TokuMX which benefit from having many more concurrent pending disk reads. TokuMX does better than InnoDB because it doesn't use random IOPs for database page writes so there is more capacity remaining for reads. Sometimes I get asked why am I not using product X where X is anything but MySQL. The products that are suggested change over time and the value of X very much depends on the person asking the question. An ex-manager from my days at Oracle told me that Oracle would be better and developers from the SQL Server team told me the same. For those keeping score there was a social network that ran SQL Server and they were kind of enough to explain why. Too often this is an assertion rather than a question and it would be more clear to say "I think you should be using X". A better question would be "Why are you using MySQL". This is the burden we carry for running MySQL at scale, but I am not in search of sympathy. There are several possible answers. With the quality of the 5.6 release and features likely to appear in 5.7, I expect MySQL to get many new deployments. This isn't just a legacy thing. MySQL performance is excellent for IO-bound workloads and almost excellent for in-memory. Manageability is about to get much better when GTID, parallel apply and enhanced semi-sync are deployed (or deployable). It isn't perfect. We need more features, PS usability is a work in progress and all of the replication goodness might not be there for most users until 5.7 is GA. Sometimes I am told that something else scales better, but scalability is rarely defined. Context is very important here. If your deployment has a few servers then you want to minimize management overhead as the cost for people is larger than for hardware. But things change when a small team runs a huge number of servers and for that it is very important to minimize hardware cost by using a DBMS that is efficient for some of high QPS, IO-bound, read-heavy or write-heavy workloads. Note that a small team running a huge deployment is an existence proof that one or both of these are true -- the team is awesome, the product is manageable. Leaving out quality of service, a simple definition for scalability is that a given workload requires A people, B hardware units and C lines of automation code. For something to scale better than MySQL it should reduce some of A, B and C. For many web-scale deployments the cost of C has mostly been paid and migrating to something new means a large cost for C. Note that B represents many potential bottlenecks. The value of B might be large to get more IOPs for IO-bound workloads with databases that are much bigger than RAM. It might be large to get more RAM to keep everything cached. Unfortunately, some deployments are not going to fully describe that context (some things are secret). The value of A is influenced by the features in C and the manageability features in the DBMS but most web-scale companies don't disclose the values of B and A.
I used the insert benchmark with concurrent insert threads to understand performance limits in MongoDB, TokuMX and InnoDB. The database started empty and eventually was much larger than RAM. The benchmark requires many random writes for secondary index maintenance for an update-in-place b-tree used by MongoDB and InnoDB. The test server has fast flash storage. The work per transaction for this test is inserting 1000 documents/rows where each document/row is small (100 bytes) and has 3 secondary indexes to maintain. The test used 10 client connections to run these transactions concurrently and each client uses a separate collection/table. The performance summaries listed below are based on the context for this test -- fast storage, insert heavy with secondary index maintenance. My conclusion from running many insert benchmark tests is that I don't want to load big databases with MongoDB when secondary index maintenance must be done during the load. Sometimes creating the indexes after the load is an option but performance in this area must be improved. The performance summary for the workload when the database is cached (smaller than RAM). InnoDB and TokuMX are always much faster MongoDB except when database-per-collection is used and the MongoDB journal is disabled. I did not attempt to run InnoDB or TokuMX with the journal disabled or even on tmpfs so I am not comparing the same thing in that case. Reasons for better performance from InnoDB include the insert buffer, less bloat in the database, more internal concurrency and a more mature b-tree (sometimes older is better). Reasons for better performance from TokuMX include fractal trees, compression and more internal concurrency. AFAIK, the MongoDB write lock is not released when there is a disk read (page fault) during secondary index maintenance. Even when there aren't faults at most one client searches the b-tree indexes at a time. MongoDB performance doesn't change much between using j:1 (fsync-on-commit) and w:1,j:0 (fsync a few times per second). The performance summary for the workload when the database is much larger than RAM. Eventually TokuMX is much faster than InnoDB. This is expected for the insert benchmark. TokuMX and InnoDB are much faster than MongoDB. TPS degrades as the database size grows: not much for TokuMX, faster for InnoDB, really fast for MongoDB. Disabling the journal doesn't help MongoDB The bottleneck is elsewhere. Not using fsync-on-commit doesn't help MongoDB. The bottleneck is elsewhere. Using database-per-collection doesn't do much to help MongoDB. The bottleneck is elsewhere. I don't know why inno-sync is a bit faster than inno-lazy, maybe HW was the cause. The key point is that doing fsync-on-commit isn't significant for this test. It also has a small impact for TokuMX. MongoDB TPS starts to drop as the database becomes larger than RAM. The gap widens between InnoDB/TokuMX and MongoDB. Another result that I saw is uneven durations for the test clients with MongoDB. With InnoDB/TokuMX the clients usually finish within a few seconds. With MongoDB I frequently see test runs where a few clients take hundreds of seconds more than other clients. Tests for mongo24-1db-lazy and mongo26-1db-lazy were stopped. I wasn't willing to wait. TPS for MongoDB continues to degrade faster than InnoDB & TokuMX. Tests for mongo2?-*db-sync were stopped at 1.7B rows. I wasn't willing to wait. More of the same. The inno-sync test was stopped. I was impatient but TPS was still pretty good. More of the same. A few tests are still running and I will update this in a few days if they finish.